Marrying deft social commentary to a rich, earthy comedy, the three comedies collected in Aristophanes' The Frogs and Other Plays offers a unique insight into one of the most turbulent periods in Ancient Greek history. This Penguin Classics edition is translated by David Barrett with revisions, an introduction and notes by Shomit Dutta. The master of ancient Greek comic drama, Aristophanes combined slapstick, humour and cheerful vulgarity with acute political observations. In The Frogs, written during the Peloponnesian War, Dionysus descends to the Underworld to bring back a poet who can help Athens in its darkest hour, and stages a great debate to help him decide between the traditional wisdom of Aeschylus and the brilliant modernity of Euripides. The clash of generations and values is also the object of Aristophanes' satire in Wasps, in which an old-fashioned father and his loose-living son come to blows and end up in court. And in Women at the Thesmophoria, the famous Greek tragedian Euripides, accused of misogyny, persuades a relative to infiltrate an all-women festival to find out whether revenge is being plotted against him. Shomit Dutta's introduction discusses Aristophanes' life, the cultural context of his work and conventions of Greek comedy. This updated version of David Barrett's translation also includes extensive notes and a preface for each play. Aristophanes (c.445-386 BC) was probably born in Athens. Little is known about his life, but there is a portrait of him in Plato's Symposium. He was twice threatened with prosecution for his outspoken attacks on the prominent politician Cleon, but in 405 he was publicly honoured and crowned for promoting Athenian civic unity in The Frogs. Aristophanes had his first comedy produced when he was about twenty-one, and wrote forty plays in all. 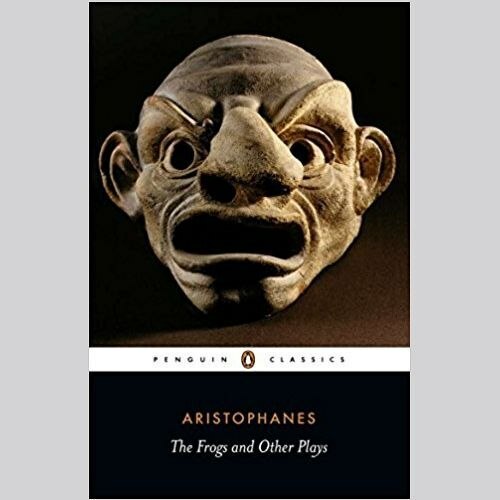 The eleven surviving plays of Aristophanes are published in the Penguin Classics series as The Birds and Other Plays, Lysistrata and Other Plays, The Wasps and Other Plays and The Frogs and Other Plays.